to own his 370-acre farm in Shenandoah County. 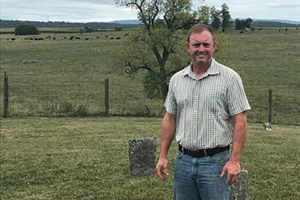 Charles Garber is proud his family’s Shenandoah County farm is part of the Virginia Century Farm program. “Our roots run deep here,” he says. Garber represents the ninth generation of his family to own Garber Farms, a 370-acre farm established around 1775. The Garber farm joins a distinguished group in the Virginia Century Farm program. Formed in 1997, the program is administered by the Virginia Department of Agriculture and Consumer Services through the Office of Farmland Preservation. To be eligible for the Virginia Century Farm designation, a farm must have been owned by the same family for at least 100 consecutive years, be lived on or farmed by a descendant of the original owner and gross more than $2,500 annually from the sale of farm products. “This is an honorary designation to recognize families that have owned farms for hundreds of years continuously,” says Andy Sorrell, coordinator of the Office of Farmland Preservation. Nearly 1,400 Virginia farms have been designated as Virginia Century Farms since the program’s inception. More than 20 family farms in Virginia are recognized as being more than 250 years old. The state’s oldest Virginia Century Farm, Summer Hill Farm in Hanover County, has been owned by the Newton and Page families since 1672. The program has three farms from the 1600s, Sorrell says. Garber’s ancestors, who were German Dunkard Brethren, moved to the Shenandoah Valley during the Revolutionary War. “At the time, this area was largely uninhabited,” he says. Today the family raises poultry, specifically small broilers used for fast-food restaurants such as Kentucky Fried Chicken (KFC) and Popeyes. “We also have about 125 to 150 cows, and we crop around 300 acres of corn, beans and wheat,” Garber says. The farm is also a distributor for cattle-handling equipment made in Iowa. “That’s been a good diversification,” Garber says. The Garbers believed they would qualify for the Virginia Century Farm program when they heard about it. “We are proud our farm has been around so long. A little bit of recognition makes you feel good,” he says.